Camping in National Forest and BLM, or at designed state and private campgrounds. In 2016 Montrose adopted a city ordinance, designating the Redevelopment Overlay, (REDO) District, to encourage residential development, and redevelopment of existing downtown properties. REDO amends zoning laws to allow for increased density, whether through subdivision, or the addition of “Accessory Dwelling Units” (ADUs). 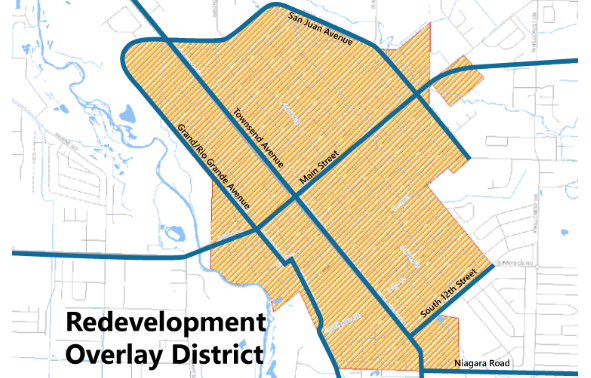 It also approves reduced dimensional standards and a larger variety of housing types in the downtown core. REDO aims to encourage rehabilitation of deteriorating housing stock, and to create more affordable housing in Montrose. It's already driving investment and home sales in downtown, a trend that should continue with the addition of Colorado Outdoors, a massive riverfront residential and commercial development project currently underway on REDO’s western border. The REDO District offers an increasing selection of “walkable” stores and restaurants. In addition, Montrose Memorial Hospital, Montrose Regional Library, and Colorado Mesa University-Montrose campus, are all located within the District, which offers a variety of zoning types from business to residential, high density and mixed use. The Montrose Water Sports Park consists of 1,000 feet of river with sustained irrigation flows, for a leisurely run with natural obstacles. The surrounding Riverbottom Park features picnic and pavilion areas, restrooms, playgrounds, ball fields, an extensive concrete and soft-surface trail network, a disc-golf course, and the Montrose Skate Park. New in 2017, the Montrose Rec Center features indoor pools with water slides, lazy river, diving boards, basketball, volleyball, kids water playground, jacuzzi and wellness pool. Plus, a fully-stocked gym with fitness machines, weights, indoor and outdoor tracks; and basketball, volleyball, pickleball courts with spectator seating. Also, racquetball, foosball, pool, indoor & outdoor climbing walls, party rooms and more. The Field House offers turf fields that support indoor sports programs throughout the year. The outdoor pool is open daily from Memorial Day through Labor Day. 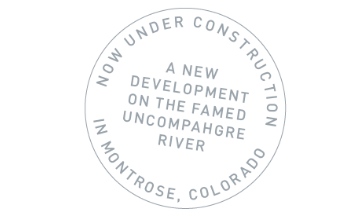 Colorado Outdoors is 164-acres of live-work space under development along the Uncompahgre River, in the heart of downtown Montrose, and bordering the city’s Redevelopment Overlay “REDO” District. The masterplan includes manufacturing and hospitality space, along with single- and multi-family residences. Abundant open space and riverfront trails will eventually connect with the City’s Riverbottom Park. Colorado Outdoors has been designated an “Opportunity Zone”, which allows for significant investor and business tax credits through the temporary deferral of capital gains, along with other incentives for businesses moving to Montrose. In fall of 2017 Mayfly Outdoors broke ground on its 41,000-square-foot state-of-the-art headquarters for the manufacture of Abel Automatics and Ross Reels. Marriott plans a 100-unit Town Place, known for its spacious suites, ideal for accommodating longer stays. Colorado Outdoors is conveniently located between the Montrose REDO District and Uncompahgre River.